UPDATE 7/02/2019: Urbnsurf Melbourne is nearing completion with first waves expected to break in Tullamarine around Easter 2019. After some testing, the team is expecting to open the surf lagoon to the public in Spring 2019. Our friends in Sydney might scoff at the thought, but Melbourne actually has some very nice beaches and spots to swim across the city. But as any Brisbane or Perth transplant realises the first time they set foot on a Melbourne beach, there's something rather fundamental missing: waves. Those who want to hang ten have to travel to Phillip Island or down the Great Ocean Road to get some proper surfing waves. 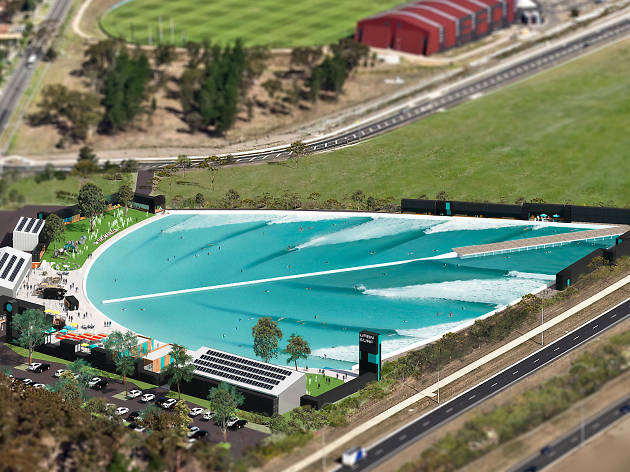 But Melbourne’s set to get its very own urban wave pool by 2019. The Urbnsurf park will be Australia’s first surf park and the world’s first full-sized surfing lagoon to use Wavegarden cove technology. If that all sounds like gibberish, let us explain: this surfing lagoon uses technology to create long, man-made waves in a closed environment. They say it will be able to pump out up to 1,000 perfect, two-metre-high ocean-like surfing waves every hour. It’ll be like Christmas for surfers and boogie boarders, who often have to deal with the temperamental nature of ocean waves. In February 2018, it was announced that Urbnsurf officially secured $28.3 million in funding to develop the park, which will be located near Melbourne Airport in Tullamarine, about 30 minutes north of the CBD. The site will house not only the 2.1-hectare surf lagoon, but also a food and bar precinct, retail store, surf academy, gym, function centre, kids' area and child-minding services and plenty of beach cabanas and grass to laze on. Urbnsurf also has grand plans to host food and music festivals as well as amateur and professional surfing competitions at the park. Construction is expected to begin next month, with a projected open date set for Spring 2019. Here are 7 other developments that will be changing the face of Melbourne by 2020. Prefer looking at the stars? Here's where to see the Aurora Australis in Melbourne.